I’m about to show you something shocking; something you may find hard to believe. That awful mess up there is my living room. Well, a part of it anyway. And don’t be led into thinking that I decided that today I would get out my Halloween decorations and put them up. They’ve been there for probably 4 or 5 days; maybe more. The sweatshirt on the table belongs to my daughter and the backpack and shirt on the sofa to my son. 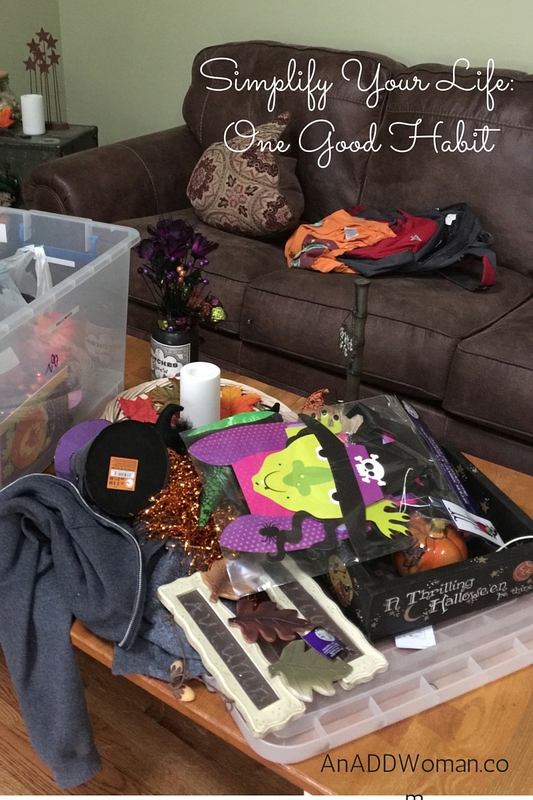 We all have ADHD in this house and there are times when things just don’t get put away. It’s hard for those of us with ADHD because we tend to forget things. We have poor short term memory so we leave things out so we remember to take care of them. But after a while, all you see is a mess. The things you left out are no longer acting as a reminder; they’re just junk. What’s my point in showing you this? I could say that as an ADD Coach this is a lesson to teach you that even someone like me – an expert on ADHD – still struggles with the same things that you do. And that’s fair; it’s true. But real reason I posted this awful picture of my home is to teach you something else. You need to work hard to put good habits into place to help you manage your ADHD symptoms. A good habit runs on autopilot and having several of them can improve your life immensely. Even when you have really good habits running on auto pilot, sometimes they just stop working. Maybe there was a change in your life or your routine, or maybe you just got really busy. Or lazy. Whatever. The good news is that once established, they’re easier to re-establish because they are familiar. You just have to work at it a little bit.